New homes should be built away from main roads, the NHS watchdog has said. The National Institute for Health and Care Excellence (Nice) has recommended houses, flats, schools, nurseries and care homes be protected from pollution. It said properties should be built in way which reduces the need to use cars to get there, as one charity warns dirty air is killing thousands of people each year. Vehicles churn out polluting gases including nitrogen dioxide, which can cause lung problems and trigger asthma attacks in both adults and children. The advice comes after Friends of the Earth this week warned thousands of areas across the UK have levels of toxic pollution which breach safety limits. Nice has today suggested councils should use their planning permission powers to make sure developers take steps to reduce pollution where people live. They should plant trees and plants outside and on roofs, and create areas for people to walk and cycle in clean air, it said. ‘Poor air quality is associated with adverse health effects, including asthma attacks, reduced lung function, and admissions to hospital,’ said the organisation’s Professor Gillian Leng. And Nice added councils should actively try to reduce the number of people on the roads, encouraging them to take public transport, cycle or walk. 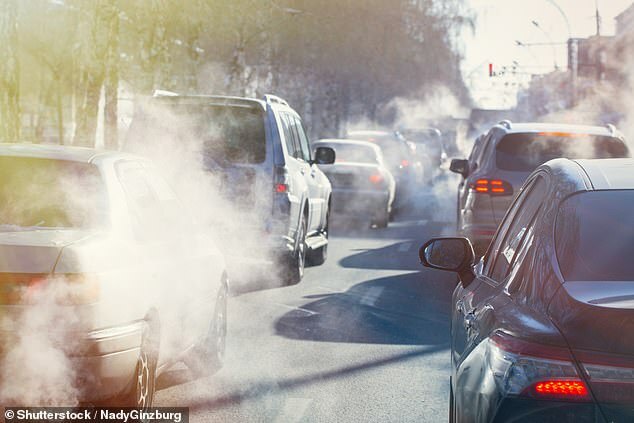 Yesterday, environmental charity Friends of the Earth revealed there are 1,845 streets across the UK which have dangerous levels of nitrogen dioxide in the air. Eight out of the 10 worst places are in London, with other offenders in Doncaster, Leeds, Banbury, Maidstone and Sheffield. The worst polluted place in Britain, the campaign group revealed, is the road outside Earl’s Court underground station in West London. Nice has suggested in the past that emergency vehicles and bin lorries should be given electric engines in a bid to start a widespread conversion to eco-vehicles, The Times reports. And it says city roads lined with tall buildings on both sides create ‘canyons’ where pollution builds up and should be avoided by planners. ‘Dirty air is currently contributing to 36,000 premature deaths a year in the UK,’ said Stephen Edwards, director of policy at walking charity Living Streets. ‘[It] is having a particularly negative impact on children. NICE’s air pollution quality standard is much needed.